Game 1 of the Western Regional is in the books as the Saskatoon Stars defeated the Westman Wildcats in Saskatoon. Shaylee Scraba and Aly O'Hara scored the goals for the Wildcats. Natalie Williamson stopped 38 of 41 shots on net. Game 2 goes on Saturday at 3:45 PM. Shaylee Scraba was Wildcats Player of the Game. Hello Wildcat Families and Fans!!! We have been told that you can live stream the game through the Saskatoon Stars Facebook page. Cheer loud and follow the tweets as well for updates!!! Westman Wildcats will be hosting Spring Prospect Camp April 9 and April 10 at Hartney Rink. All female players born 2002-2006 are welcome to register. Please register by selecting the link Westman Wildcats 2019 Spring Camp on the menu bar. 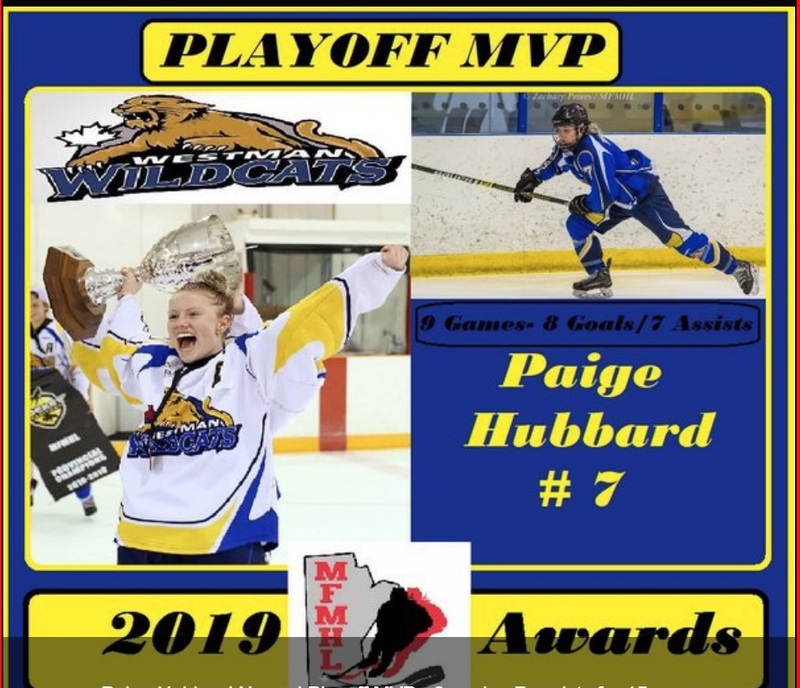 The Westman Wildcats would like to congratulate that Paige Hubbard was awarded the MFMHL playoff MVP. Hubbard scored 8 goals and added 7 assists for a total of 15 goals in 9 games. 2018-2019 Westman Wildcats League Champions!!! The Westman Wildcats completed the sweep on Wednesday night in Hartney, defeating the Winnipeg Avros 2-0. Aly O'Hara scored what turned out to be the eventual game winner with 1:24 remaining in the opening period to give the Wildcats the lead they would never relinquish. Paige Hubbard scored the empty net insurance goal with 2:29 remaining in the game to secure the victory. Natalie Williamson was outstanding in the Wildcats net stopping all 29 shots in the game. The Avros played like a desperate team all night and pushed the Wildcats to the edge numerous times in the opening two periods but the Wildcats finally found their game in the 3rd period and took control of the game. 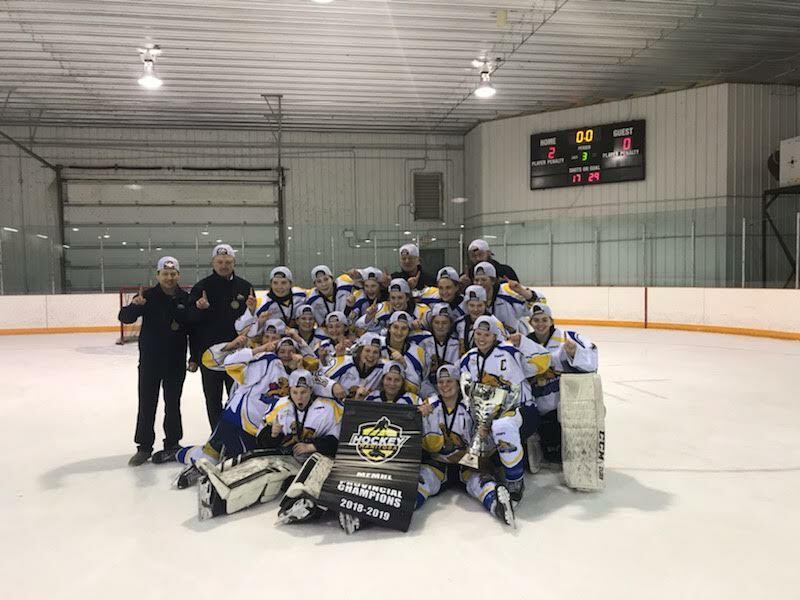 The Wildcats will now face the winner of the Saskatchewan Female Midget Hockey League on the weekend of April 5-7, location in Saskatchewan to be determined. The Wildcats would like to thank all the fans who came out to cheer us on tonight. We really appreciated all the support. The Westman Wildcats defeated the Winnipeg Avros 4-3 at the Seven Oaks Arena in Winnipeg on Monday night. The Wildcats got out to a 3-0 lead early in the 2nd period but were unable to protect it as the Avros got one back in the 2nd period and two more in the 3rd period to tie the game up with 3:44 remaining in the game. Jori Hansen-Young would respond with 2:51 remaining as her snapshot from the point found the top corner to put the Wildcats ahead. The Wildcats were able to hold on as they were put on the powerplay late in the game and controlled the play for the remainder of the game. Natalie Williamson was solid in net when she needed to be, stopping 39 shots to pick up the win. Game 3 goes Wednesday night in Hartney at 7:30 PM.